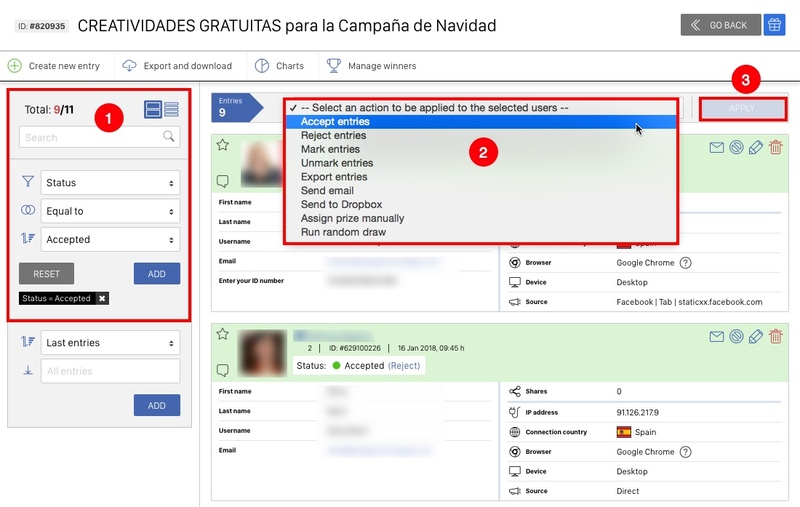 As an administrator, you can manage the entries in your contest, sweepstakes or promotion from the "Participants" section, available in the management page of the promotion. Add participants. It can be useful to add a participant that couldn't be registered and that you want to include in the promotion. There is also an option to include the participants from Twitter and Instagram. Export and download. You will find the options to download a CSV/Excel file with all the participants' information, and also, voters' information, contest audiences and contest pictures (if it's a photo contest). Charts. Choose this option if you want to see the data of the participants in the graph. You can cross several data and download, print or save. Manage winners. This option allows you to directly access the Winners section from where you can manage the prizes and winners of your promotion. Delete all users. 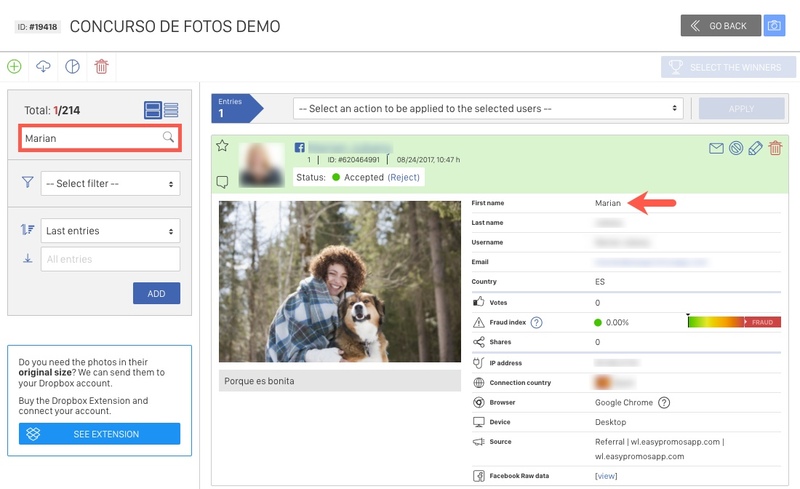 This option is enabled in White Label promotions and it is useful to speed up the process in case you have done a test with the promotion and you now want to eliminate all the users. Order by. You can modify the order of this list to see "first entries", "most users recruited" participants or "top score" participants first, etc. Filter by. If you want to see only some participants depending on their characteristics in the list, you can use the filter option to select: Accepted entries, Rejected entries, Pending entries or Winners participants (for Instant Win promotions). Only available in Premium and White Label promotions. Accept entries. This action allows you to mark as 'accepted' all the entries previously filtered. Reject entries. This action allows you to mark as 'rejected' all the entries previously filtered. Mark entries. It allows to mark with the icon of a star all the previously filtered participations. Unmark entries. It allows to remove the mark of the star to all the previously filtered participations. Export entries. This action allows to export an Excel file with all the entries previously filtered. Send email. This action allows to send an email to all the sub-set of users previously filtered (option only available with Premium & White Label). ZIP pictures. It allows to download a ZIP with all the images uploaded by the participants. Option only available for photo contests. Send to Dropbox. It allows to download and save to your Dropbox account the original photos uploaded by the participants. Option only available if you have enabled the Dropbox extension (more information). Assign prize manually. 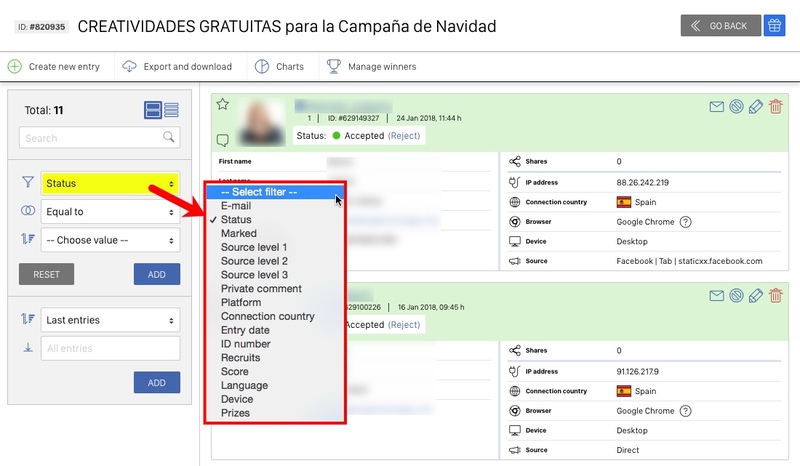 This option allows you to assign a prize manually to the segmented group of participants. Run random draw. This action allows to perform a sweepstakes among all entries previously filtered by using the Winners tool. Search. Use the browser to find an entry by its name, surname, Facebook Id, email, country, etc. In this section you will find all the entries, and you will be able to edit them (also if they are already published), to rotate, un-publish, eliminate, etc. Which actions can you carry out? 1. Send email. 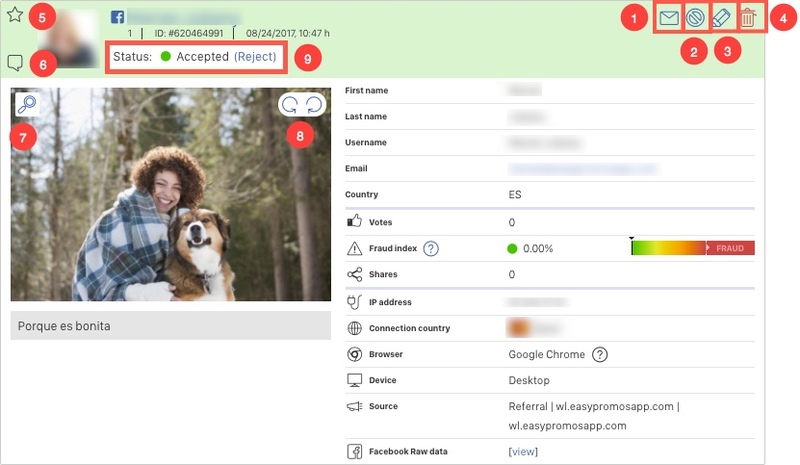 This option lets you send an individual email to this user by using the Emails Platform. 2. Add user to the blacklist. This option allows you to include this user to your blacklist if you don't want this participant to be able to enter your sweepstakes. 3. Edit the entry. By clicking on the "pencil" icon you will see the entry form of this participant with all the fields. Modify the field you need and click on "Finalize" to save the changes. You can also change the picture or modify the video information. 4. Delete an entry. By clicking the "bin" icon you can eliminate the participation. This action deletes all the entry information from the database, so you won't be able to recover it. 5. Mark/Unmark this entry. You can mark entries manually to create a segment and apply bulk actions as sending an email or select the winners with the marked entries. 6. Add a private comment to the entry. This option allows to add a note related with this entry to remember something interesting or important. Only the administrators of the promotion can see it. 7. Magnifying glass. View full-size picture. 8. Rotate the image to right or left. 9. Entry status. You will be able to "Accept" or "Reject" the entry to show it or not publicly. Rejected entries won't be entered in any sweepstakes. What user information will you find? You will find all the information that the participants filled in the entry form. You will also find their profile picture, the network used to connect/submit entry, as well as the photo/video uploaded to participate in the contest. In addition, you will obtain the IP address, the device and browser used, and information about how many times they have shared the promotion, number of users recruited, number of votes, their score, as well as for the winners, you can also check here the reference to the prize they have won, and if the prize is a "downloadable" (for example, a coupon), you can obtain the download URL of the prize won by each user. You will be able to download all this information into a CSV/Excel file from the left column, "Export and download" section.